The Bisbee Mining and Historical Museum will open the Smithsonian exhibition Water/Ways which focuses on the relationships between people and water, in Bisbee, 6.2. The Heinz History Center hosts History on Tap featuring a talk by Theresa McCulla, historian of the American Brewing History Initiative at the National Museum of American History, on how Prohibition influenced the alcohol industry, in Pittsburgh, 6.3. Space Center Houston hosts Allan Needell, curator of space history at the National Air and Space Museum, who will talk about the Saturn V rocket, in Houston, 6.7. 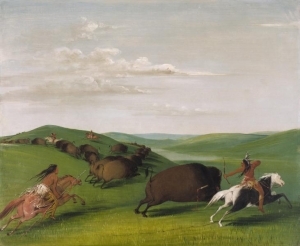 Soon to be on view in Wyoming, George Catlin’s, Buffalo Chase with Bows and Lances, 1832-1833, oil on canvas, Smithsonian American Art Museum, Gift of Mrs. Joseph Harrison, Jr. The Buffalo Bill Center of the West opens the exhibition Albert Bierstadt: Witness to a Changing West which features three George Catlin paintings on loan from the Smithsonian American Art Museum, in Cody, 6.8. 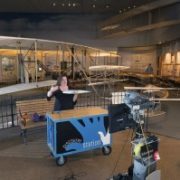 The International Storytelling Center will screen First Ladies Revealed: Twists of Fate, a program from the Smithsonian Channel, in Jonesborough, 6.11. 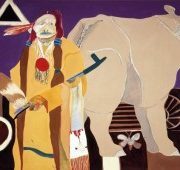 The Smithsonian Associates lead a day-long Natural History of the Mid-Atlantic tour which will make a stop at Annmarie Sculpture Garden and Arts Center in Solomons, 6.16. The Heritage Farm Museum and Village will screen the Smithsonian Channel’s program Aerial America: West Virginia in Huntington, 6.20, 23. The Polk Museum of Art opens the exhibition The Von Wagner Code featuring the etching Roman Chariot Race, on loan from the National Museum of American History, in Lakeland, 6.23.